When I was young, I remember the often corny, yet well-intentioned, motivational and inspirational posters that my teachers would tape to the walls. Whether it was kittens, scenes from nature, or celebrities telling me how cool reading is, I noticed that some posters appeared in more than one classroom. Throughout my formative years, certain posters crept up more often than others, and whether it was just that those posters were more popular, or if the teachers just got a bunch of freebies throughout the district of the same ones, I always thought it would be fun to make your own. And that’s just what I did today during one of Rushton Hurley’s digital media workshops. Since I use most of the tools and resources extensively that Rushton talks about, I thought I’d use my “exploration” time to use a piece of creative commons media, rather than just find an example to save for later. I thus present to you, my own “super-cheesy” inspirational poster made with the help of this creative commons licensed image created by pfv on Flickr. Knowledge….it’s cheesy. 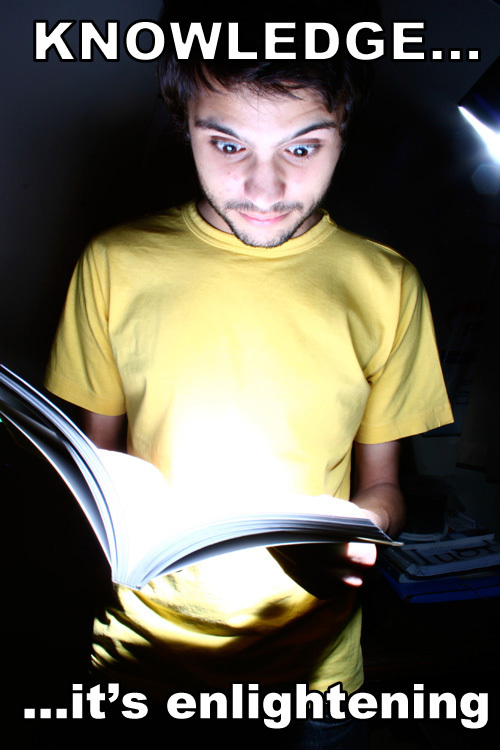 I know that images of books or monitors with bright lights illuminating someone’s face are trite and overused, most likely because the metaphor is so easy to convey via visual media. The point is, in about 5 minutes I was able to create my own cheesy motivational image using a Creative Commons Flickr search and Adobe Photoshop (although GIMP or even Preview on your Mac would do this for free). I didn’t spend any money, I can most likely print this off for less than 25 cents at my local library or school, and I can create new ones each month, week, or even every day if I get bored easily…which I do. Feel free to create your own “lazy” inspirational posters and share them!